Baconfest is this Friday and Saturday, and you know what that means: Sunday is gonna suuuuuuuuuuuck, because instead of eating approximately four TONS' worth of bacon dishes made by local chefs from a record 171 restaurants, you'll be eating... not those things. 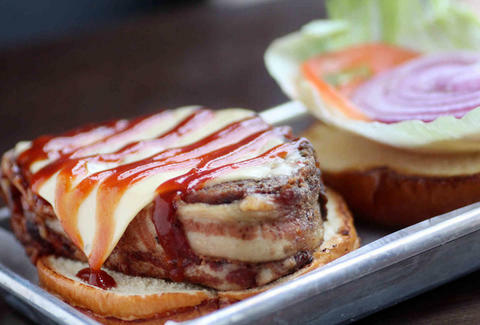 Luckily, though, you can be eating THESE things: the 14 best bacon dishes in Chicago. 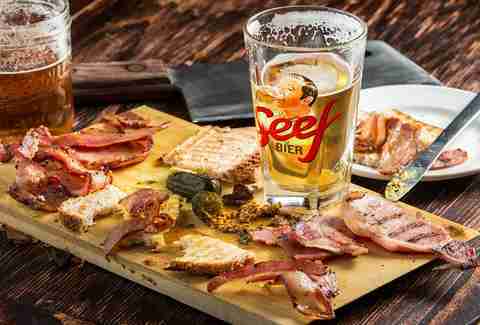 Paddy Long’s answer to the common cheese/charcuterie board comes in the form of a wooden board laden with Irish bacon, hickory smoked bacon, cracked pepper bacon, and Danish bacon -- along with all the necessary accoutrements. And by “accoutrements,” we mean gherkins, grainy Dusseldorf mustard, and toasted Irish soda bread. This meaty monstrosity packs 2lbs of ground beef with 2lbs of ground pork, all encapsulated within a 16-slice bacon weave. 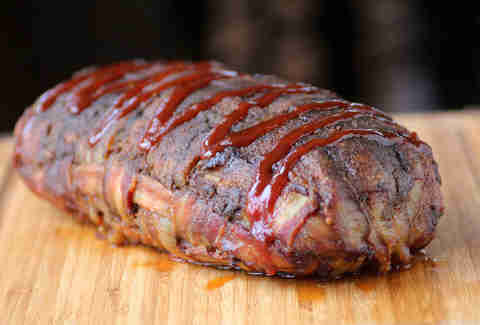 Toss in some top-secret bomb sauce, a swath of spices and herbs, a brown sugar massage, and 3hrs spent in a hickory wood smoker and you have Chicago’s first and only WMAD (Weapon of Mass Appetite Destruction). There are burgers topped with bacon, and then there are burgers made with bacon -- with juicy, smoky bacon literally ground into the patty. At Bottlefork, you can score the latter. 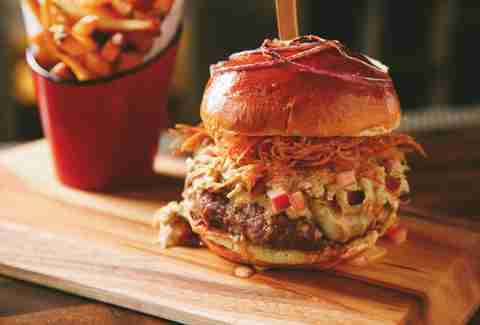 The ultra thick, wood-grilled patty pushes a serious bacon flavor profile while Vermillion blue cheese, shoestring potatoes, special sauce, and a house pickle balance things out. Oh you want hot dogs made with bacon, too? Cool. 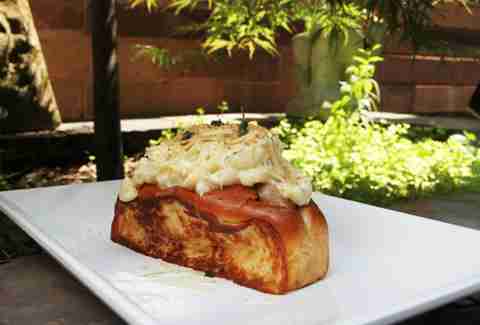 Instead of a boring bacon-wrapped dog, though, go for the bacon mac & cheese dog at Franks 'N Dawgs -- which tops a SAUSAGE MADE OF GROUND BACON with a heaping pile of TRUFFLE MAC AND CHEESE. They also have a brunch dog, a pork loin breakfast sausage topped with cob smoked bacon and a fried egg, in case you're feeling like seconds. 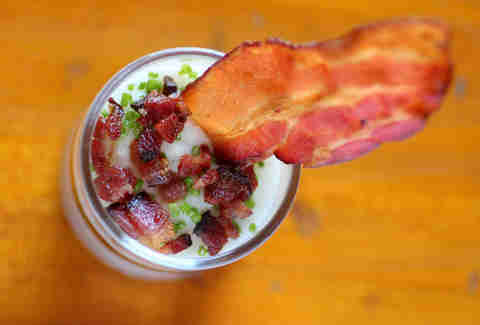 There are BLTs, and then there’s Kuma’s aptly named All Pigs Must Die. 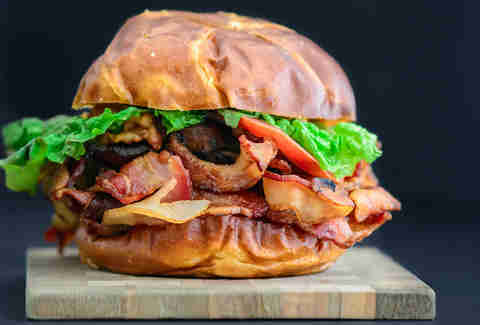 The latter comes with a pretzel bun layered with Sriracha aioli, 10oz of thick and juicy applewood smoked bacon, lettuce, tomato, and meat sweats. Lots and lots of meat sweats. 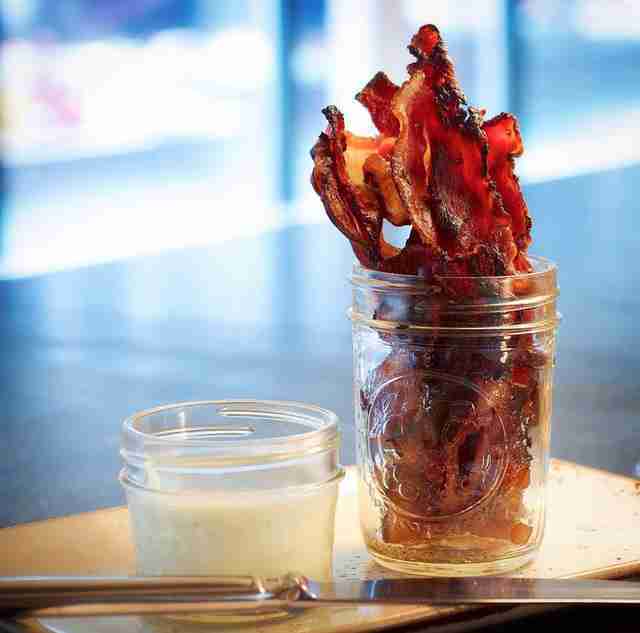 Sometimes you just need to keep it simple: as simple as a cup of crispy, house-smoked beef bacon, served in a mason jar with a side of blue cheese dip. New this year in the premium seating section, Sox fans can now enjoy bacon flights, featuring an assortment of flavors from BBQ spice, to jalapeño, to black pepper, to brown sugar glazed. 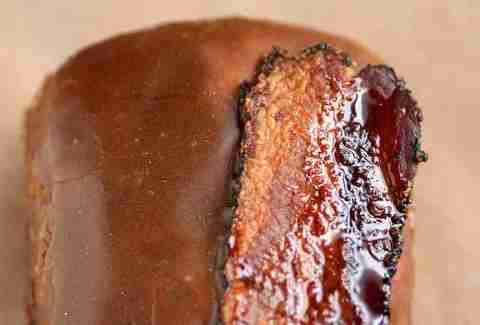 This is in addition to the ever-popular bacon on a stick, which now comes with a maple glaze. Like all bacons should. What happens when two of breakfast’s best hand-held indulgences collide? Pure and unadulterated gastronomic magic, that’s what. Glazed & Infused’s highly coveted Maple Bacon Long John is coated in a maple glaze made with real maple syrup and topped with a massive slice of candied bacon. 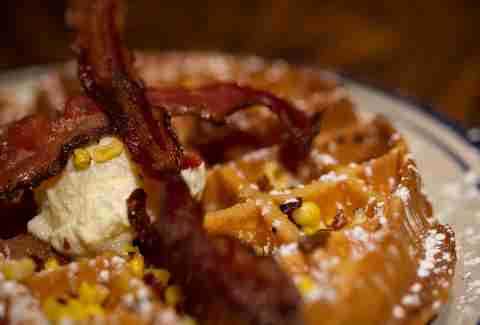 When a basic side of bacon at brunch just won’t cut it, opt for a perfectly balanced sweet corn waffle with bacon BAKED INTO THE THING at this Downtown country resto. Crafted by Chef Doug Psaltis, this sweet-and-savory brunch marvel comes blanketed with an extra helping of smoky black pepper bacon, maple syrup, and a dusting of confectioner’s sugar. Tired of dousing your popcorn with a few pumps of fake butter and sprinkling it with not-found-in-nature cheese powder? 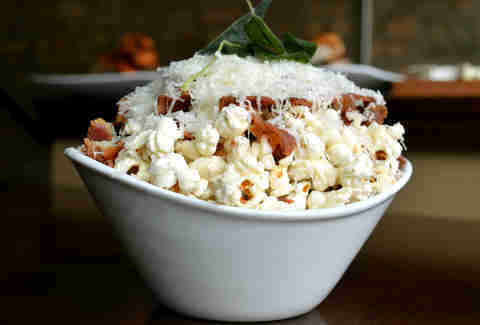 Fortunately, Revolution Brewpub has a no-fail upgrade: highly addictive popcorn tossed in bacon fat and mixed with bacon pieces, shaved Parmesan, and crispy sage. Healthy breakfast parfaits, eat your heart out. This multi-layer creation is stacked with succulent smoked pork, caramelized onions, cheddar grits, and, of course, bacon, courtesy of the on-site bacon bar. 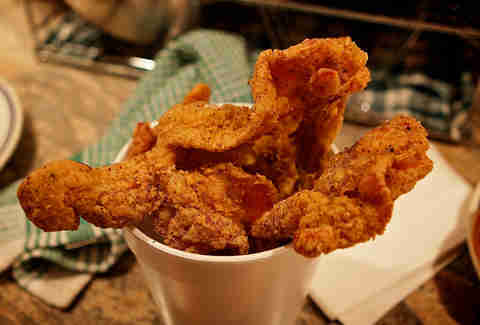 Pair yours with bourbon and the restaurant’s fall-off-the-bone, dry-rubbed, St. Louis-style spare ribs. 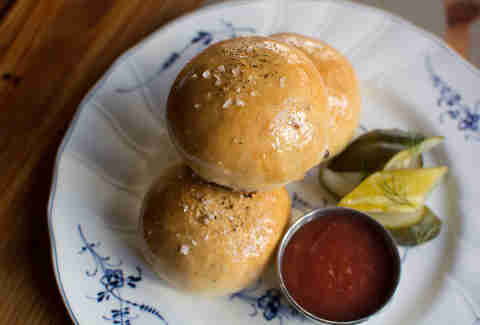 Lacquered in bacon fat, sprinkled with sea salt, and FILLED WITH CHUNKS OF BACON, Chef Jimmy Papadopoulos’ ingenious bacon buns are the stuff that smoky, bacon-y dreams are made of. House-brined pickles and plum marmalade on the side offer contrasting flavors that brighten and lighten up the rich, bacon-forward dish. 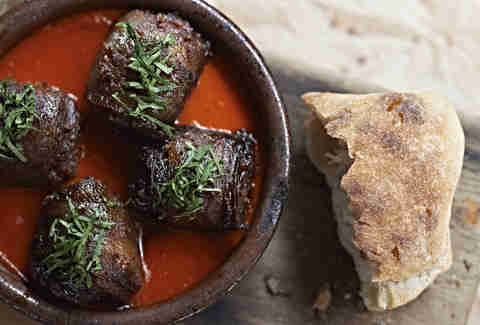 Medjool dates and bacon are a tried and true combo, but Chef Perry Hendrix’s take on the classic bar snack ups the ante and packs a serious bacon flavor punch with a glorious chorizo center and sweet/hot piquillo pepper-tomato sauce. Pro tip: sop up every last drop of the sauce with a side of sumac-glazed pork belly. Or, oh yeah, some bread. We guess. Jay Gentile is Thrillist's Chicago Editor and thinks bacon deserves way more real estate on the food pyramid. Agree with him on Twitter @ThrillistChi.